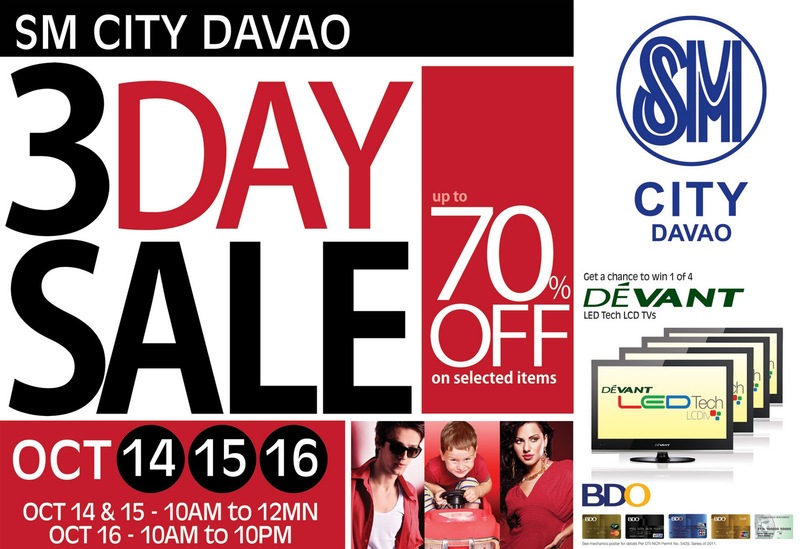 All roads lead to SM on October 14, 15 and 16, 2011 as SM City Davao opens its doors for the GRAND 3 DAY SUPERMALL-WIDE SALE! Enjoy up to 70% off on great selections MALLWIDE! Shop and get a chance to win 1 of the 4 DeVant LEDTech TVs! Mall hours are extended up to 12 MN on October 14 & 15 and until 10 PM on October 16. Catch the first 2-Hour SMAC Sale (SM Advantage Card) for additional discounts on October 14 in SM Department Store, Ace Hardware, Surplus Shop, Levi's and Toy Kingdom. All these and more only here at SM City Davao where we all come together. See you! Per DTI-NCR Permit No. 8238, Series of 2011.